The first Yolo Causeway was built a hundred years ago to take motorists across the marshy flatlands of the Yolo Bypass. In the 1970s, another species joined commuters in making use of the elevated roadway: bats. Every summer, roughly a quarter-million migrating Mexican free-tailed bats nestle between the Yolo Causeway's expansion joints. Kept warm by the concrete overhead, they give birth to baby bats between flights where they feast on insects above the bypass. The nightly flights are a spectacle that draw Californians looking to enjoy the show. 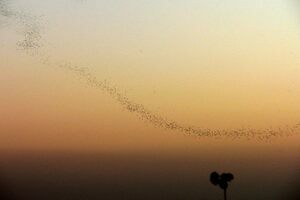 Sometimes called "batnadoes," long ribbons of bats leave the causeway at dusk every night, even flying miles up into the air to chase their prey. The bats have ample food to choose from and are fairly well protected. The air above the wet, marshy landscape—which is said to be of one of the largest wetlands restoration projects in the American west—is thick with bugs.